NASA’s Juno spacecraft captured this view of Jupiter's north polar region during a close flyby on Aug. 27, 2016. NASA's Juno Jupiter probe won't be settling into its final orbit around the giant planet this week after all. Juno was scheduled to fire its main engine for the final time during the probe's close Jupiter flyby on Wednesday (Oct. 19), in a maneuver that would reduce the time it takes the spacecraft to circle the gas giant from 53 Earth days down to 14 days. But the mission team decided to postpone the burn in order to investigate an issue with valves that are part of Juno's fuel-pressurization system, NASA officials said. "The valves should have opened in a few seconds, but it took several minutes," Nybakken added. "We need to better understand this issue before moving forward with a burn of the main engine." The earliest that the engine burn could now occur is during Juno's next close Jupiter flyby, which will take place on Dec. 11, NASA officials said. 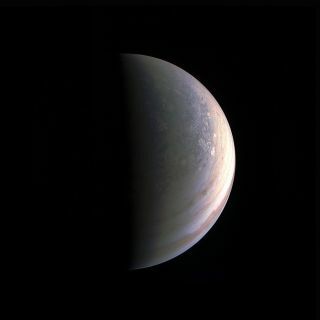 The Juno team had planned to observe Jupiter with a limited number of the probe's nine science instruments during Wednesday's close approach. But, as a result of the valve issue, all of the instruments will be turned on during the upcoming flyby. Even if Juno never makes it into that 14-day orbit, the spacecraft will still be able to gather good data about Jupiter, mission team members said. "It is important to note that the orbital period does not affect the quality of the science that takes place during one of Juno's close flybys of Jupiter," Juno principal investigator Scott Bolton, of the Southwest Research Institute in San Antonio, said in the same statement. "The mission is very flexible that way. The data we collected during our first flyby on Aug. 27 was a revelation, and I fully anticipate a similar result from Juno's Oct. 19 flyby." The $1.1 billion Juno mission launched in August 2011 and arrived in orbit around Jupiter on July 4 of this year. The spacecraft is collecting data about the huge planet's composition, structure, gravity and magnetic fields, in order to help scientists better understand how Jupiter, and the solar system overall, formed and evolved. The original mission plan called for Juno to shift into the 14-day orbit this month, then circle Jupiter more than 30 times before ending its mission in February 2018.